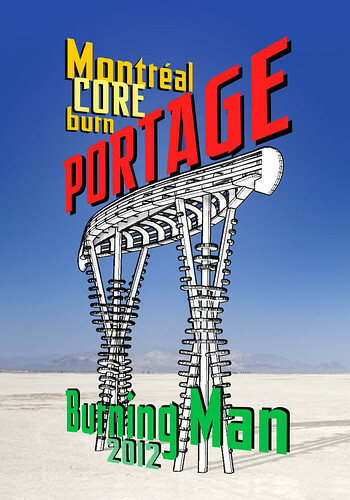 The Brûleurs de Montreal Burners are nearing completion of "PORTAGE", their sculpture for this year's C.O.R.E. Project. Later this month at BRC, there will be a ring of thirty-five sculptures around The Man. This world-spanning project is called C.O.R.E. -- the Circle Of Regional Effigies. Contributed by Burning Man communities around the globe, these sculptures will be displayed during the festival, then burned in a single massive conflagration on Thursday 30th August. Montreal's artwork consists of two wooden figures carrying a giant canoe, over twenty feet long and nearly as tall -- representing the spirit of multi-cultural collaboration that makes Montreal such a creative, vibrant place to live. Our sculpture is nearly finished, but we need your participation to help us bring PORTAGE to the desert. It's a big undertaking and we'd appreciate any donation you can make.